Primary Drive Rear Steel Sprockets are made to meet or exceed O.E.M. specifications. Made of high-grade hardened steel, these sprockets are made to be durable and offer long wear. Lightening holes add to the aesthetic appeal while reducing weight. Primary Drive Rear Steel Sprockets are manufactured with precision for a perfect fit. Whether you ride a motorcycle or ATV, Primary Drive is sure to offer the best value in sprockets. Durable replacement steel rear sprocket for motorcycles and ATV's. Great own replacement to get a few more teeth on the rear. The color is already fading but the sprocket hasnt worn at all yet. It was cheap so not surprised about the color. No big deal either but color is mildly scratching off. Fits great. Not bad for a cheap sprocket. it was cheaper. When i got it, it looked better than it did online and it looks great! Good product bolted right up no issues. Very tough. I'm experimenting with gearing with steel sprockets, and then will get something lighter when I find the combo I like. Feeling the weight of it in my hand really shows how heavy steel is compared to aluminum. Came as advertised And is a perfect replacement for original parts. Perfect fit, durable, affordable. Proper maintenance and you will get good life out this sprocket. Bought this as an inexpensive replacement for my sons bike and it seems to be holding up pretty good. Heavy duty sprocket at an incredible price. Haven't ridden with it yet but it's price alone makes it hard to pass up. Only giving it one star because I haven't used it yet. Great sprocket for the price. Little on the heavy side, but last forever. Can't go wrong on the track or in the woods. I bought a driven 45t steel sprocket for my Xr650l. It is way heavier and has much more metal in it than the JT equivalent. So much that I didn’t bother installing it. It is also designed with multiple mount patterns. This is probably to save cost but adds a lot of weight. If you want a steel sprocket for your Xr650l and don’t want to add considerable weight. Consider something else. Great sprocket for the price, over 20 hrs on mine still looks fresh. The sprocket is strong, easy to install, well built, and does what it is designed to do. I ride hard! Primary Drive sprocket out last renthal, this is steel so as long as your not trying to reduce overall bike weight buy this one! Must bang for your buck! I’ve been using the primary drive sprockets for xc racing for 5 years and have had 0 failures. Great product for less money. Nothing beats these sprockets for the money. Durable as all get out, cheap, and good fit. Sometimes the outer coating peels off, but that doesn't matter to people that buy $20 sprockets. We just want something durable and cheap. 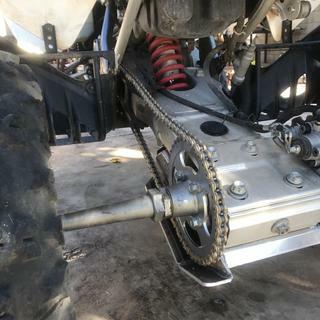 Fits perfect, I changer both sprockets and the chain at once per recommendations online and haven’t had any trouble at all. I geared olio a tooth on the front and it made a lot of difference, very nice on a gen2 KLR anyway. Perfect fit, seems just as durable as OEM, if not more. I have a few thousand miles on it so far and notice no irregular wear. My only complaint, I wish they had it in black. Great sprocket at a fraction of the cost. i got this sprocket a while back for a 2007 klr650 and after about 1000 miles of not particularly gentle use (a couple of parking lot wheelies come to mind) i noticed it starting to twist. out of pure curiosity and disregard for the rest of my drive train i decided to see how much farther i could push it before i just couldn't run it any longer. i wound up making it to an estimated 1500 miles before i deemed it unusable, it was missing half the teeth if not more, warped entirely around the chain to the point that the chain was clicking in to the sprocket and then clicking back out like a seat belt instead of just a smooth in around and over. over all for $11 i'm impressed that it went this far, the install was seamless, but as compared to how a more expensive sprocket would last it really wasn't that long. the only real use i can think of for it is to throw a cheap but functioning part on a bike you're about to sell just to make it look a little better than a sprocket with 5,000 miles on it and maybe get a little more money for it, though doing it would make you an absolute cur. the best comparison i can make would be a fast food burger, for the price it's alright, but it will never really compare to something that you spent a little more money on. I realize this is the "cheapy" version of this sprocket so like what do I expect. It weighs about 3 times what the manufacturers original weighs. Replaced the broken sprocket on my 05 crf250r with this one and it looks and fits great! Just as it is in the description, the fitting was just perfect. Good quality, I would definitely reccomend, it’s a good product at a good value. Good quality rear sprocket, I would reccomend because of the value and the quality, very good product that will save your wallet. Bought this to give the WRR more low end for tractoring around in the woods. Bolts right up, no new bolts needed as it has both style holes. Went from stock 13/43 to 13/47. Bought a 120 link chain so that I would have enough links to use stock chain later on as bike was new. I went to a 48 tooth from the stock 45 on my XR650L. For my purposes it really works great. No problems with fitment, seems well made. Can't beat the price on these. Got this sprocket as part of a sprocket and chain package. Both sprockets and chain for the price of just the chain from DID for example. I'm not a racer just a casual rider the extra weight doesn't bother me at all. Good sprocket for the price. For the price it is a good sprocket. If you are a trail rider or weekend warrior this will work for you! 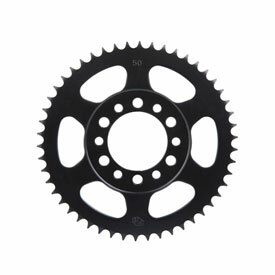 What color will this sprocket be for a 2013 crf 250r? BEST ANSWER: I only run these because I ride a lot of sand, and aluminum sprockets get worn out too fast in sand. It will surface rust but there will not be enough rust where you will have to worry about this. The paint holds up good. It'll rust on the teeth that touch the sprocket. Technically, anything steel can rust, but with that being said, we haven't had one rust yet, except maybe light film between teeth where chin rides, but as soon as you move, it's gone. Think of your rotors. They rust much? I have used these sprockets for years, and they do not show signs of rusting. However, it is a good idea to spray your chain and sprockets with WD40 after washing your bike. Make sure you don't get any on your brake disc. I ride Enduro in the northeast, and I'm always getting my bike soaked, but I have not had an issue with it rusting. Yes. Steel will rust. Aluminium won't rust but also won't last as long as they wear down faster. They only rust if you get them wet. Haha They will rust a bit but not bad. keep them clean. The rear sprocket has not rusted and does not appear that it will rust. I keep my lubed and have not had a problem. Great set for the price. Yes, anywhere the plating wears off such as the teeth. I currently run a 13 front and 48 rear sprocket on a YZ250F. I find I am a little high geared for the type of riding I do. I am wondering if I should go with a 50, 51, or 52 tooth rear sprocket? A change of 1 tooth on the rear sprocket is barely noticeable to most riders. 2 teeth more on the rear sprocket makes a small difference. If you're bogging or stalling the engine too often with the current gearing I would suggest the 52 tooth sprocket. This will provide more useable torque on slow tight trails. Also, note it will reduce the bike's top speed by ~ 5 to 7 mph. Ok thanks. I do a lot of riding in the mountains on some nasty rocky trails and I have stalled it a couple times trying to lug my way through rocky, hilly areas. I run a 53T on my CRF250R (51T is stock) and it pulls great in tight woods areas. I'm somewhat of a beginner, getting back into dirt bikes and I find this prevents me from stalling in low gears. I' be afraid of going more than 2T bigger than stock in my situation due to the total loss of top end. Dropping a tooth on the front will make a difference. Is this sprocket a 520 pitch? BEST ANSWER: These are machine specific. they vary from machine to machine. if you select your machine it will be what ever the machine is. I ordered one for my CRF250X which uses a 520 pitch chain. Yes it works great with a 520 chain. 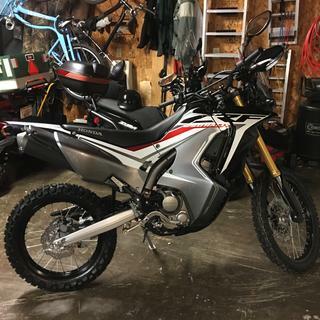 im going to be turning a 2005 KLX 125 into a dualsport what gearing should i go with for on road use? It all depends on the type of terrain you will be riding on. Flat roads? Hilly roads ? Roads with a fair amount of curves? Are you going to be going off road a fair amount of the time ? There are quite a few questions to be answered before picking the sprocket ratio that might be needed to fulfill your needs. this is totally up to you. we cant suggest a gearing. everyone is different in what they like and what they want. Roughly how much does a 50T sprocket weigh? BEST ANSWER: I can tell you that the 50T for the YZ450 is 1192g (I bought one to try it vs the stock 49T). I did not like the 50T so I bought a 49T Primary Drive aluminum, and that was only 375g. That's a 817g (1.8lbs) difference! It's around 30oz give or take an ounce. 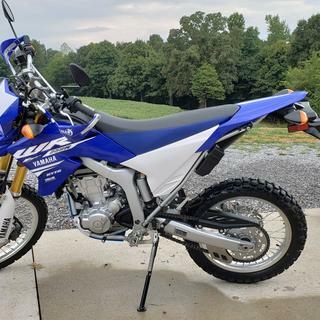 What bolts should I get to mount this on my 2009 wr450f? Aka what are the stock bolt size? Hello I need more torque for my banshee 350 should I run a 13 tooth in front and a 40 tooth in rear? BEST ANSWER: either 12/40 or 13/42 will work but it all depends on riding preference . I normally go 2-3 teeth bigger on the rear sprocket. Will the OEM bolts from a wr250r fit this sprocket? BEST ANSWER: OEM bolts from the WR250R will fit this sprocket. Have used these sprockets for years with the original fasteners. Can I run a 13/39 sprocket set up with a 96 link chain for my ltr 450? BEST ANSWER: You might should get a 98 link chain to be on the safe side. What color would the sprocket be for an 01 CR250? BEST ANSWER: it will be a steel color. Will this sprocket fit a XL250r? If I use a 14 tooth in the front and an 49 tooth in the rear on my wr250r what size chain do I need? BEST ANSWER: What year is your machine? Thank you. We suggest going up 3 links from your stock size. So a 520 x 112 should work. What color would it be for lt250r 1991-1992? Will this fit a 2000 TTR125 with the small bolt pattern? BEST ANSWER: Yes, as long as this is the way it came stock it will fit your machine. Make sure you enter in the make, model, and year of your machine in the drop down boxes. BEST ANSWER: This one has 4 bolt holes. I also checked the OEM sprocket and it has 4 bolt holes as well. It may be that you have a different sprocket hub than what came from the factory. What color is this specific sprocket for my machine? BEST ANSWER: What machine would this go on? Thank you. I had a tech go out into our warehouse and look at this sprocket for your machine and he said that it is silver. For the CRF250R it is also silver. BEST ANSWER: Yes, it should still fit. Some of the sprockets fit several machines so they have an extra bolt pattern on them. I have a 2001 yz 125 and wanted to putchase a 40t rear sprocket but dont know which one will I recieve ? BEST ANSWER: These are just a generic picture. You will receive the correct style and bolt pattern for your machine. It will be a steel sprocket in a silver finish. What color sprocket would I be receiving? Black or silver? I would be ordering for 2004 yz125. BEST ANSWER: The Primary Drive Steel Sprockets are Silver in color. BEST ANSWER: You will need to add 2 chain links for every 2 teeth you add or subtract from your sprocket. In this case, you would be adding 4 teeth to the rear so you will need to get a chain that is 4 links longer than your stock chain. Ex: For a 2012 WR250R it has a stock chain length of 108 so you will need to get a 112 link chain. BEST ANSWER: It depends on your machine application. Some machines require a larger center hole, some require a different center shape. Most large MX bikes use the sprocket pictured on the right. Most ATV's use the sprocket pictured on the left. Most mini or trail bikes use the sprocket in the middle. What is the actual weight of the sprocket? Or the average weight? BEST ANSWER: The rear steel sprocket could weight anywhere from 1.5lbs to 3 lbs depending on the machine and size of the sprocket.